Wikimedia Commons has media related to Princess Margarete of Saxony. 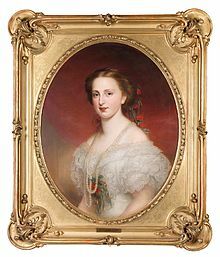 Princess Margaretha of Saxony, Duchess of Saxony (German: Prinzessin Margaretha Karoline Friederike Cecilie Auguste Amalie Josephine Elisabeth Maria Johanna von Sachsen, Herzogin zu Sachsen) (24 May 1840 – 15 September 1858) was the eighth child and fifth eldest daughter of John of Saxony and his wife Amalie Auguste of Bavaria and a younger sister of Albert of Saxony and George of Saxony. She was born in Dresden, then in the Kingdom of Saxony. Through her marriage to Archduke Charles Louis of Austria, Margaretha was a member of the House of Habsburg-Lorraine and an Archduchess and Princess of Austria and Princess of Hungary, Croatia, Bohemia, and Tuscany. 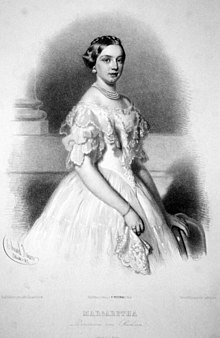 Margaretha married her first cousin Archduke Charles Louis of Austria, third eldest son of Archduke Franz Karl of Austria and his wife Princess Sophie of Bavaria, on 4 November 1856 in Dresden. The marriage was happy, but only lasted two years and remained childless. On a trip to Italy, Margaretha contracted typhoid. She died on 15 September 1858 at the age of 18 in Monza. Her heart was interred in the Hofkapelle in Innsbruck. ^ a b c d e Darryl Lundy (28 Jan 2009). "Margarete Karoline Prinzessin von Sachsen". ThePeerage.com. Retrieved 2009-05-26. ^ a b c d e f Paul Theroff. "SAXONY". Paul Theroff's Royal Genealogy Site. Retrieved 2009-05-26.